Willow Vetch is a specialist equine professional, life coach, intuitive consultant and bio-resonance therapist. 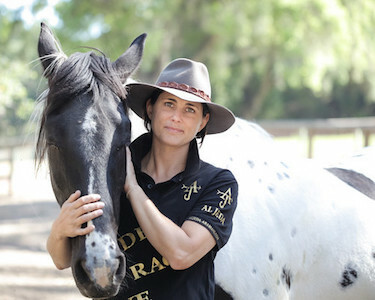 She works with a wide range of clients, all over the world, including those at Olympic level, multiple Royal Families in the Middle East, individual horse owners and pleasure riders. Willow also enjoys her work with people who have no background or familiarity with horses but want to learn from Nature and the wisdom of horses. Willow regularly conducts workshops and clinics throughout Australia and the USA. As an alternative health practitioner (trained in bio-resonance therapy) Willow treats all types of illness and injury, specialising in difficult/extreme cases, in both people and animals. Her work is one of a kind, highly skilled and integrative in nature. Willow’s passion is sharing the insights she has gained from her own life and her equine partnerships and pursuits, plus her unique intuitive insights. The focus of her work is offering committed and curious individuals and groups the opportunity to greater understand communication, connection and authenticity within partnerships and life. She currently works throughout Australia, the USA, Europe and the Middle East.